A portion of a full-wall mural for the school's Design Laboratory. St. Andrew's Episcopal School is a grade 3–12, college-prep institution, located just outside Washington, DC, and dedicated to finding better ways of teaching and more effective ways of learning. Out of their studies came the school's new D! 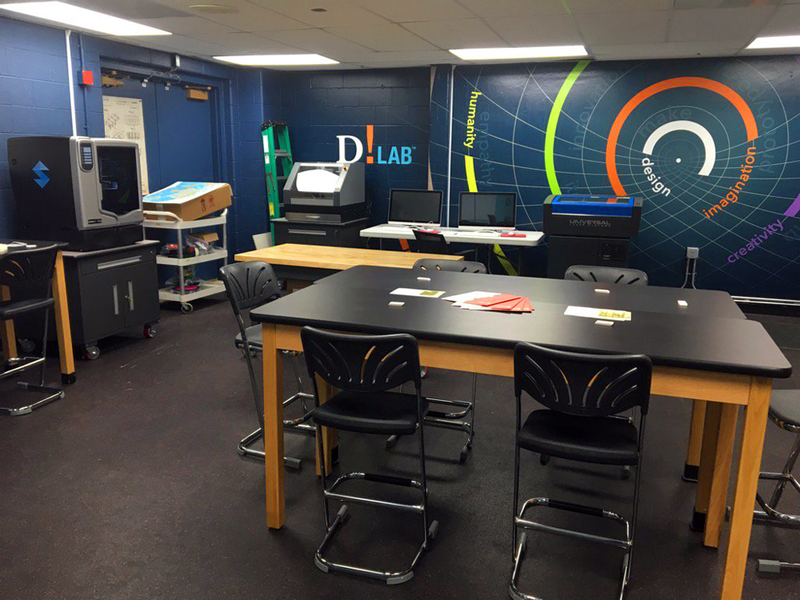 Lab or Design Laboratory, employing the best teaching methods augmented by tools like 3D printers. The D! Lab needed a new logo and a full-wall mural, whose elements would encourage students to think creatively. 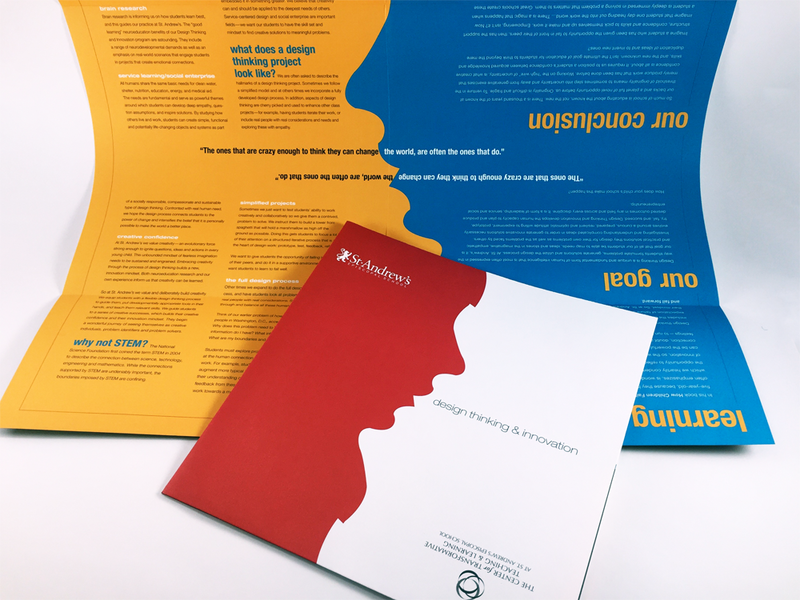 This work followed on our earlier success creating a Design Thinking brochure meant to capture attention and physically embody the philosophy of the school and the Center it describes. A non-standard size and square aspect ratio, along with the poster-like inner fold, bi-directional text, and figure-ground optical illusion of the two faces, all challenged convention and suggested an innovative approach to teaching. 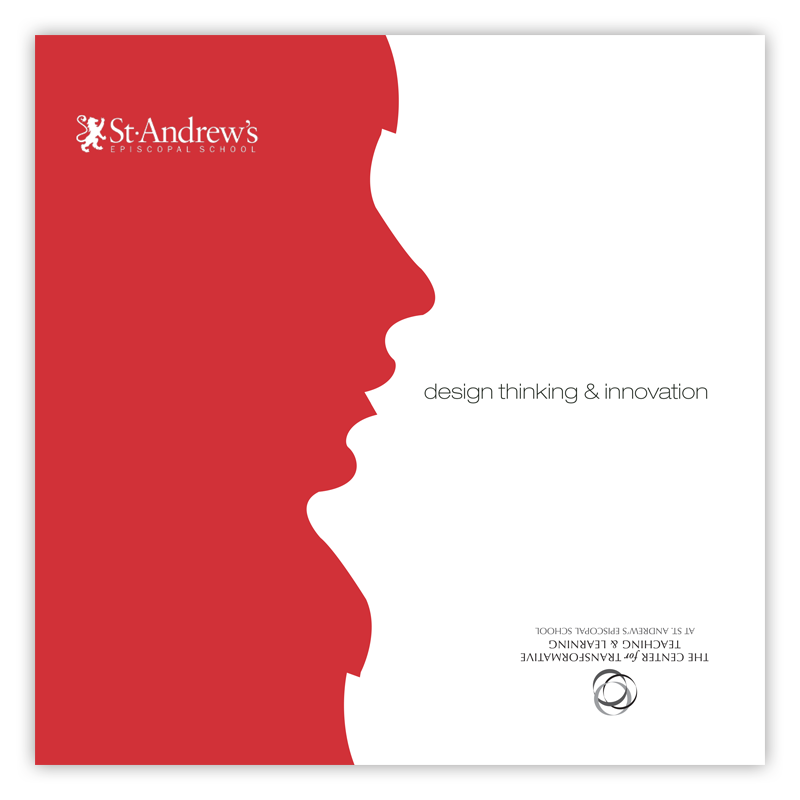 But our most educationally intriguing work for St. Andrews was creating a set of flat, 5-inch diameter magnets to be arranged on white boards by students as they worked through the process of design thinking. Each disk magnet contained a single word, integral to this creative exercise, and when configured in different arrangements often triggered new approaches and creative insights. Supporting education-related clients will always be a special interest and ongoing reward for our firm. "...this is a phenomenal publication. In design, words, and the program and thinking that it reveals, this is as good as anything the school has published in my 13 years! Judging by prospective families' reactions this morning, they felt the same way."